buyers and sellers to do a lot of business with Brazil. 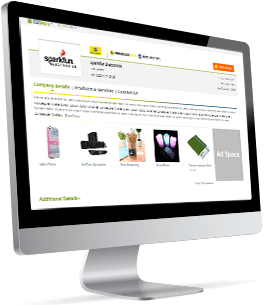 Find sellers on B2Brazil using our internal search engine or browsing through our many categories and subcategories of products and services. You can use our filters to refine your search and get customized results. Visit the hotsite of sellers, evaluate company profiles, access contact information and details of products and services that these companies offer. When you find sellers of the goods or services of interest, simply register, fill out the online contact form on the Seller's own hotsite and submit your request. The seller(s) will receive your contact and respond to your request. Premium Members or companies with B2B Verification will pass through a process of verification of registration information and therefore have more credibility than Free Members! Become a qualified and verified buyer on B2Brazil. This way, sellers will have more confidence in deadling with your company. B2Brazil has a simple and practical tool to assist in your buying process. When you post your buy request, we will receive and distribute your requirement(s) to various relevant sellers, in addition to distributing it on our Leads Central area. Register as a Seller and create your hotsite on B2Brazil. Fill out the required information and more so you can have a comprehensive, complete and credible member profile on our portal. Login to your account management area on B2Brazil and add content about your products and / or services for your hotsite. Buyers base their browsing and searches on product and/or service keywords, so if you do not include them you will have limited success on our platform. Ready! Your company is ready to be promoted by B2Brazil!! Buyers can access your hotsite and make business contacts and deals with you. Login and answer contacts and leads in your account management area. Whenever possible, to include your best product images, because this helps buyers to see and better understand the quality of your products. To get more exposure and greatly increase your chances of doing business through B2Brazil, upgrade to our Premium Membership. For a very affordable price you will receive significant benefits on our portal. Premium Membership is the most efficient, effective and inexpensive means to crack the Brazilian market. If you have a specific offer to sale your products and / or services, you can include it via our "Post your sell offer" or even directly on your hotsite. Just include your offer for us to distribute to potential buyers, in addition to disclosing your offer in our Leads Central area. To be careful in dealing with new contacts. Here some suggestions on how to deal and communicate with new contacts.